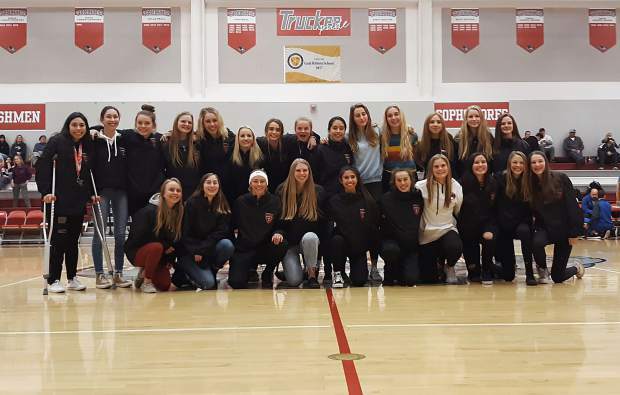 The 2018 Truckee girls’ soccer team won a third straight state title last fall and were honored at halftime of the boys’ basketball game on Friday. A pair of championship teams from 2018 were honored at halftime of Truckee’s basketball games last Friday, allowing fans, parents and students to pay tribute to a handful of student-athletes that brought Truckee championship trophies. Last year’s Truckee baseball team, dubbed the “2 Out Nightmare” by fans, was recognized during intermission of the girls’ game, followed by the three-time state champion girls’ soccer team taking the floor during halftime of the boys’ game. Last spring, Truckee baseball captivated the town en route to the program’s first state championship since 2012. The “2 Out Nightmare” lived up to their moniker time and again, behind clutch hitting that often extended innings and broke the will of opposing defenses. The team finished the year 27-11 overall and graduated four seniors that played big parts in the squad’s success. The team’s four seniors from a year ago have each gone on to play college baseball. Pitchers Gary Grosjean and Colin Just are at Mendocino College. Tyler Ferrera is at Mayville State University and Joel Estabrook is at Yuba College. The current Truckee baseball team will begin its Class 3A title defense at the beginning of March. For the past three seasons, one of the most dominant programs in the Nevada Interscholastic Activities Association, regardless of class and sport, has been the Truckee girls’ soccer team. After dominating Class 3A competition on the way to undefeated seasons in league play during the past two seasons, the Truckee girls were challenged in 2018 on the way to a three-peat as state champions. For the first time since 2015, the Wolverines suffered a regular season league loss, falling 4-1 to South Tahoe last September. The loss snapped a streak of 46 straight regular season league wins, a span that lasted 1,084 days. The girls would lose another contest to North Valleys during the regular season to finish with a league record of 16-2. Truckee seemed to return to form as the season came to a close, blowing out nearly every opponent during an eight-game winning streak to set up a Northern League championship matchup against South Tahoe. The Vikings would get the better of Truckee during a 2-1 victory to take the league title, but a week later, the teams matched up again in Las Vegas — this time with the state championship on the line. In the state game, one of the greatest soccer players to ever take the field in Nevada, Truckee senior Ava Seelenfreund, did what she’s done her whole high school career, scoring a pair of goals and assisting on another as Truckee rallied back from a 3-2 halftime deficit to take the state championship, 4-3. The Lady Wolverines will graduate Seelenfreund, Amber Simonpietri, Isa Gonzalez, Daphne Lezo, Noelle Seppi, Megan Flynn and Tatiana Klenk from its championship roster.